Of Other Spaces is about how space affects human behavior and experience. The exhibition asks us to consider the ways in which spaces are charged with authority, and both serve and suppress our actions and ways of relating. 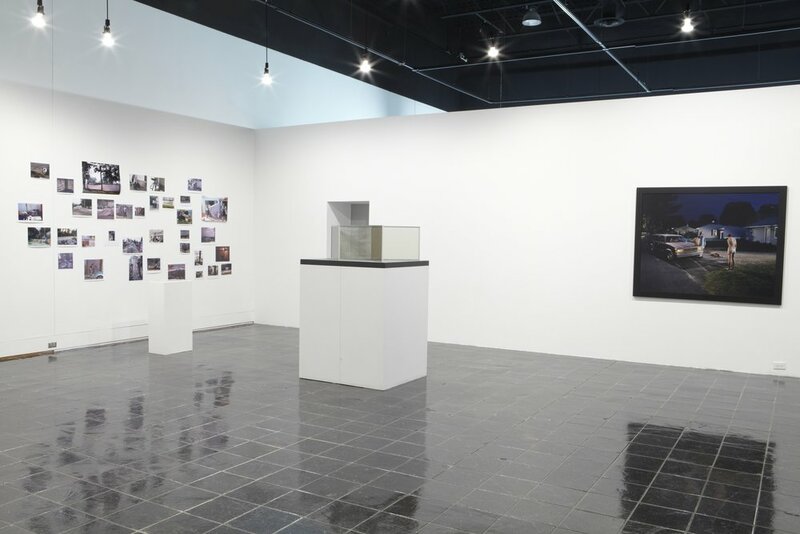 The concept of “other spaces” is inspired by the philosophy of Michel Foucault, especially his thoughts on social relations and cultural practices expressed in the intersection of space, architecture, and history. In a rarely cited 1967 text by Foucault, entitled Of Other Spaces, Heterotopias, he introduces what he callsheterotopias–different or other spaces. Hospitals, prisons, schools, libraries, museums, fairgrounds, cinemas, beaches, cemeteries, gardens, hotel suites, train stations, and even mirrors have the potential to be other spaces. Other spaces are essentially virtual. They function in accordance with personal memories, associations, experiences, and imaginings that one has of these very real sites. By making common practices strange, Foucault’s writing often initiates conversations about habitual actions, in this case, in relation to space. The collection of works of art on exhibit here and the reprinting of Foucault’s text on “heterotopias” in the exhibition catalogue form the visual and philosophical catalyst for thinking about the function and meaning of space in everyday life. This exhibition includes a screening of She Might Belong to You (2007) by Eva Meyer and Eran Schaerf, Metropolis, Report from China (2006) by Maya Schweizer and Clemens von Wedemeyer, and Will there be a sea battle tomorrow? (2008) by Laurent Montaron at the film/video theater at Wexner Center for the Arts. As part of the exhibition, the film is screened at the film/video theater at Wexner Center for the Arts. Jane and Louise Wilson, Erewhon (Blue Skin Bay I), 2004. C-print on aluminum in plexi box. 70.75 x 70.75 inches. Courtesy of the artists and 303 Gallery, New York. Installation view. Sarah Schönfeld, from the series Wende Gelände, 2007. C-print, 48 x 60 inches. Courtesy of the artist and Kunstagenten, Berlin. Installation view. Foreground: Michael Brown, The People's Playground, 2008. Cast aluminum, 71.75 x 69 x 2 inches. Courtesy of the artist and Yvon Lambert Paris, New York, London. Mary Jo Bole, History of Penal Institution Sanitation, 2008 Chardon™ Kohler prison sink with fused-on silk screened decals. 15 x 18 x 15 inches. Courtesy of the artist and John Michael Kohler Arts Center, Sheboygan, WI. Suzanne Silver, Kafka in Space (Parsing the Eruv), 2009. Wood, rubber, wallboard, plaster, metal, rope, canvas, metal leaf, chalk, tape, vinyl, neon, dimensions variable. Courtesy of the artist. Background: Candida Höfer, Narodni knihovna Praha V, 2004. C-print, 72 x 88 inches. Courtesy of the artist and Rena Bransten Gallery, San Francisco, image courtesy of Candida Höfer/VG Bild-Kunst, Bonn. Alain Bublex, Untitled (TGV without windows), 2006. Mixed media (model of TGV, acrylic resin, adhesive), dimensions variable. Courtesy of the artist and Galerie Georges-Philippe & Nathalie Vallois, Paris. Gordon Matta-Clark, Conical Intersect, 1975. 16 mm film on video, color, without sound, 18:40 minutes. Courtesy of Electronic Arts Intermix (EAI), New York. Guillaume Leblon, Found Objects (Miami Beach), 2008. Mixed media, five elements: 7.5 x 6.75 inches each. Courtesy of the artist and Galerie Jocelyn Wolff, Paris. Robert Buck, Constellation ("To find the Western Path, Right thro the Gates of Wrath"), 2008. Steel railing and artifacts (headstone, surveillance mirror, steer skull, 3D print, Tumi luggage bag, and barricade), 112 X 373 X 110 inches. Courtesy of the artist; Stephen Friedman Gallery, London; CRG Gallery, New York; and Anthony Meier Fine Arts, San Francisco. image courtesy of the artist and Luhring Augustine, New York. Maya Schweizer, Le Musée de Daniel, 2004. Photography installation and catalogue, dimensions variable. Courtesy of the artist. Christian Tomaszewski, PLAYTIME, 2009. Carpet, clear globe, two sofas, two chairs, one ashtray, one lamp, black mirror, fabric screen, three doors and sound (40 minutes), 950 square feet. Courtesy of the artist. Eva Meyer and Eran Schaerf, She Might Belong to You, 2007. Film, 37 minutes. Courtesy of the artists. HD film, color, sound, 11:41 minutes. Courtesy of the artist and galerie schleicher & lange, Paris.